Once known as the McIntosh of Japan, Accuphase no longer needs bear such comparisons. Best known these days for their fine CD Players, Accuphase is also well-known for their amplifiers that are among the very best and most innovative of their type. The E-450 is the next-to-the-top model in the “E” Series, being a Class “AB” unit where, for reasons of cost-savings, a Class “B” topology is used with a small amount of bias current at the output to reduce the distortion (clipping of the waveforms) that is normally created in a strictly Class “B” amplifier. In contrast, a pure Class “A” amplifier has an enormous amount of current running through its transistors even with no signal present. 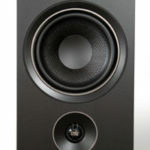 Although a Class “A” design has none of the distortion produced by Class “B”, Class “A” is quite inefficient, produces a lot of heat and requires much more robust, and expensive, output devices. Class “AB”, then, as everything in engineering, is a compromise between cost and performance. 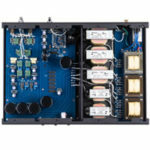 Many solid-state amplifiers today are Class “AB” due to its higher efficiency and lower cost. The resourcefulness of the designer in using circuitry to reduce the inherent output distortion defines the quality of the device. Accuphase calls their method of Class “A” the “bias current MCS+” (Multi-Channel Summing Up). I was unable to find a thorough explanation but my understanding of this design is that the bias circuitry sums multiple feedback signals and then uses the fully balanced, common-mode noise rejection throughput of the amplifier to provide a purer waveform at the output. While more economical than full Class “A”, this solution is still hardly inexpensive, but does result in extremely low distortion for a device of this type. 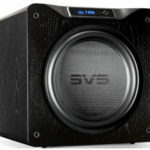 As much as I dislike the cheap volume pots (hint- they’re blue) used even in very high-end amplifiers, as well as also having a distaste for stepped attenuators with their pops, clicks and myriad resistors, I was at first dismayed by the thought of a very fragile input signal encountering an active device. However, as we will see, the AAVA-II imparts no coloration to the music separate from what one would expect from the amplifier in toto. AAVA-II also eliminates my absolute number one pet peeve of remote volume controls: The three-day delay between pushing the button and then having the motor badly overshoot the desired level by about 100 decibels. You may as well get off your posterior and walk over to the control for all the good it does. Which brings us to my only quibble with the ergonomics of the E-450; why can’t there be an LED you can see across the room like there is for the input selector? If there can only be one, Highlander, I would rather it be the volume control – I know which input button I pressed. Speaking of ergonomics, I love the giant speaker terminals that accept bananas or spades and can be tightened down quite firmly with just your fingers. Additional luxury touches are the plastic caps that cover all unused RCA inputs and the smoothly working front panel cover that hides all but the volume and input controls. This is a really lovely component with its soft gold finish and large panel meters. I knew from experience that this highly complex, solid-state device would require a great deal more burn-in than I was used to with tube amplifiers. Just for laughs, however, I sat down with my notebook to record what I heard from the first instant. I put Diana Krall’s latest on the turntable, From This Moment On. First, I was literally overwhelmed by the deep bass and control. My benchmark was the KR Audio SXI with its 1610 Kronzilla tube, but this was well beyond. Next, I became aware of the incredibly low noise floor. In fact, there is no noise floor. There’s just no sense of amplification: there’s either music or the absence of music. This is accompanied by a realization that I was listening to the lowest distortion output I had ever heard. The music, on the other hand, was really horrid. The mid-range was confused and lifeless, DK’s voice projected way too far out into the room and the piano image was a mess. The soprano sax solo on ‘Willow Weep’ sounded like a snake charmers horn and everything else was veiled. So now, having had my chuckles, I went back to listening to other components while leaving the E-450 constantly on with an 8-ohm load over the speaker terminals. During the midnight hours I fed a CD signal to it on repeat. About 100 hours later I came back to it. I went right back to Diana: ‘Come Dance With Me’. Of all the amps I’d heard, this was now the soundstaging champ: wide, deep and airy. Eva Cassiday sounded just gorgeous on “Fields Of Gold”, although the DAT format of the recording intruded more than it usually does. Beauty always has a flaw. Even after significant break-in and the delights of high-power with near-zero distortion, the very slight graininess of Class “AB” is heard on certain passages rich in upper treble notes. There was a ‘forwardness’ to the sound as well as the soundstage. This, to me, describes “solid-state” sound. I’m a tubeaphile. I am at home with distortion when it adds to the musical reality in my mind. I noted that in Sonny Rollins Volume 2, his tenor sax and J.J. Johnson’s trombone had more air and detail, more delineation of the individual notes but less sonority and sense of real instruments playing in my room than I’m accustomed to. On the other hand, this amplifier is extraordinarily “quick”; all that reserve power gives the music a sense of pace that reaches down into the lowest notes. The low bass on the very well-recorded Volume 2 and everything else I listened to clearly presented, not just the individual notes down to low “E”, but also the overtones, the harmonics that allow hearing into the wooden body of the Double Bass. The oh-so-stiff 18” cone of the JBL 2241 results in ultra-low distortion; but it takes an exceptional amplifier to control the movement and then damp it so as to avoid the overshoot and hangover of the lowest notes. Good amplifiers give you the individual bass notes. Great ones give those notes life even when the strings are slapped rather than picked or bowed. The E-450 does all that. Only the $37,000 tube mono-blocks I’m currently reviewing match the E-450 in low bass control. Apart from the very slight upper treble grain, all the rest of my nit-picks are matters of taste. Listening to the E-450, you learn that power has a quality all its own. Like all high quality amplifiers, it gets all the detail and leaves one to judge the tone, texture and “rightness” of the music. The AAVA-II volume control is a subject all by itself. When I described it to my amp-designer friend, he opined that all that switching circuitry must be audible, perhaps like crossover distortion. During a visit to hear the unit though, we both agreed that it could not be heard to intrude on the music even when purposely engaged on difficult passages with wide dynamic shifts or long intervals. There must be some effect – in audio everything matters – but there was nothing that stood out from the overall impression of the sound. The ability to raise or lower the volume instantly, even in 2 dB increments, from your listening chair, once experienced, is a capability hard to live without. When Constantine asked if I would like to review a Class “AB” amplifier, I guess I surprised him by immediately saying yes. I already knew something about Accuphase. I related to him that high-efficiency speakers, like the $50,000 XLH Ref-1812’s weren’t strictly the domain of low-powered, Class “A” Single-Ended-Triodes. In fact, most of the veterans on the Altec-J.B. Lansing Heritage Forum use high power amps to drive their A-7’s and 4430’s. Until you’ve heard the dynamics of JBL or Altec high-efficiency speakers driven by 200, 500 or even 1,000 pure watts, you’ve missed a significant audiophile experience. I welcomed the opportunity to hear a quality, high-power amplifier no matter what the circuit topology, and I knew that Accuphase represented high-tech, musical components. $4500 dollars is a lot of money; but in the high-end audiophile world that sum defines the entry level and is not exceptional. Unless you have the desire, knowledge and experience to choose a circuit, acquire the parts and build your own amplifier, you can’t duplicate the quality of sound you get with commercial equipment at this price point for less money. My “Simple 45” amp, for example, contains over $1200 just in parts. Forget all those “world-beater” amplifiers you read about for $1200. Some of them are good but don’t approach the performance that more money buys. I believed in “world-beaters” too, until Dagogo provided the opportunity to audition the expensive components I had once scoffed at. Unfortunately for my fellow mendicants, money does indeed talk. 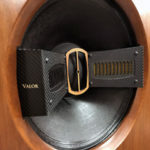 Even for those who can afford the best, if you’re a tube-rolling, cable-obsessed audio perfectionist with deep, deep pockets and suffer from Audio Asylum, circuit flavor of the day angst, you won’t choose this amplifier. The E-450 is for the hard-working music lover who wants to come home, fire it up (or better yet leave it on 24/7), have dinner and then rock out to the Doors or St. Martin-In-The-Fields. No tubes to fiddle with, one less set of cables, direct hook-up, if you like, to your PC music server and a very tasty musical experience, totally controlled from your chair. Now I wonder if the Class “A” Accuphase series, maybe the A-30 or A-45 power amps might be just what it takes to bring me over to, shudder, the solid-state “dark side”. Hey Axiss, you still have my address?